In spite of being a bit cathedraled-out we nonetheless felt the need to see this city’s famous building. And, we truly lucked out when we met John O., a guide who answered our questions and offered a tour. With him this cathedral became illuminated with treasures and connecting points to other historical facts and figures. As one would expect of a building this size, the grounds on which it sits ensures the cathedral maintains a prominent position in the city. When approaching the entry both Max and I noticed the face carvings that on closer inspection displayed tortured contortions. Welcome to Medieval Christianity. Once inside, the cathedral opens up into a huge central area (nave) leading to the choir area (quire) and ending at the altar with Trinity Chapel behind it. Sitting in the middle of the nave between the north and south transepts (perpindicular to the nave) is the spire, the largest of all of Britain’s cathedrals. For the holiday season a huge tree stood at the entrance to the nave, which made the space less austere in its Gothic grandeur. Before we met our guide we began looking around and noticed a detailed model of the cathedral under construction. The display provided an excellent lesson on the coordinated activities required for each construction phase, helping us understand how these remarkable medieval craftsmen could create such a magnificent cathedral with relatively simple yet clever tools. We wandered towards the center of the aisle to a large modern fountain. The plaque identified it as a font commemorating the 750th anniversary of the cathedral in 2008. And, this leads to the truly astonishing fact that this impressive structure was built in only 38 years (1220-1258). What a feat considering most cathedrals at the time required up to 100 years. The font also provided a great photo op. When we met up with John we began our informative tour at the medieval clock, considered to be the world’s oldest working mechanical one (1386) and still running today. It keeps time by only striking the hour (no clock face with minutes is displayed). From there we saw the tomb of William Longespee (1176-1226), the first person to be buried in the cathedral. It retains some of its original color, painted over 800 years ago. What’s more interesting, though, is Longespee’s history. As the recognized illegitimate son of Henry II (the one of Dover Castle and husband to Eleanor of Aquitaine… the 1968 movie THE LION IN WINTER provides an interesting take on the history of these two), Longespee’s half-brothers were King Richard I aka Richard the Lion-Hearted (ruled 1189-99) and King John (ruled 1199-1216). Through his marriage to the Countess of Salisbury, he became an Earl (3rd one of Salisbury). He served under both of his half-brothers, fighting alongside Richard in Normandy and later holding appointed positions under John. He was John’s advisor during the 1215 Magna Carta negotiations and one of the reasons one of the four original copies resides at this cathedral. In spite of John’s putting his seal on the Magna Carta June 15th 1215, he renounced clause number 61, which provided 25 barons the power to over-rule the King. This set in motion the First Barons’ War (1215-17) to which the French added their two cents. John died during the war and his son, Henry III, was crowned King. I won’t go into any more detail but the lead-up to the Barons’ rebellion is fascinating. As one writer put it, there was a perfect storm composed of land, power, women, religion, and money (http://www.thamespathway.com/chapter9/runnymede-and-magna-carta.aspx). William Longespee supported the young king and continued to wield influence both in administrative and military positions. He was rumored to have been poisoned by Hubert de Burgh (as chief political and justice official for Henry III perhaps he was jealous of Longespee’s influence over the young king?) and upon opening his tomb in 1791 remnants of a rat was found inside his skull carrying traces of arsenic. Lovely story but could be just a story as opposed to a true story. and, at one point, John asked us to sit and just listen to the singing. He mentioned it was his favorite carol, “Abide with me”, one of Max’s favorites as well. Continuing on we entered a small chapel where the only remaining carved symbol (the pomegranate and the rose) of Katharine of Aragon and Henry VIII still rests on the ceiling (all others in the country were replaced by Anne Boleyn’s falcon). Tucked away in a little side chapel evidently it wasn’f found by Henry VIII’s smashing squad. and Edward Seymour (1561-16120 and wife Lady Catherine Grey (1540-68), younger sister of the nine-days-queen, Lady Jane Grey (both Grey stories are tragic). I won’t go into Catherine’s life story here but did discover there’s an Ipswich connection: because she married Edward secretly without her cousin Queen Elizabeth I’s permission, Catherine tried to get help in pleading her case. The place she did so was in Ipswich (!) when the court was on progress (when a ruler toured his/her realm). Our tour with John ended in the Chapter House where Salisbury’s original copy of the Magna Carta resided. John also pointed out the intricate needle-pointed cushions sitting atop the stone seats against the walls , several of which were created by his wife. We left the Chapter House walking out into the open-air corridor surrounding the Cloisters, the largest of the British cathedrals and designed for processions. Must say our tour of Salisbury Cathedral was another major highlight of our Winter Ride thanks to the considerable knowledge and warm welcome we received at the hands of our gracious guide John. He certainly added some wonderful Christmas spirit to our December in the UK. 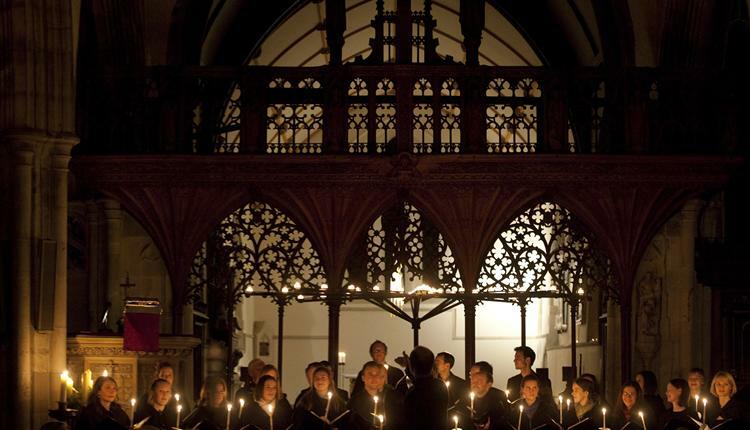 Our Winter Ride finale ended with candlelit singing in St. Martin’s Church, reputedly the oldest building in Salisbury (mentioned in a 1091 document). Named after the earliest settlement of Salisbury, the Sarum Voices choir beautifully highlighted ethereal notes with their a cappella singing. May there be peace on earth and joy in everyone’s lives. This entry was posted in 2015 12 UK & WALES - Central & West Coast, 2015 Winter Tours, COUNTRY, Europe, Wales, WINTER TOURS on January 7, 2016 by margaretlynnie. In case my last sentence in PART II didn’t help you locate our next stop it’s Shakespeare’s home where we headed. With all of the fame he engendered beginning during his lifetime, his hometown is a bit like an amusement park, albeit a tasteful and cultural one. And, we happily went along for the ride. Our first stop was his childhood home where his parents John and Mary lived, the largest one at that time on Henley Street. His father is painted as quite a wheeler-dealer who didn’t just make gloves but also bought and sold commodities and even became a Bailiff, the highest public office in Stratford. Shakespeare grew up here, the third eldest of eight children, and returned to this house with his wife Anne Hathaway for the first five years of their marriage. The house itself is quite small inside and included John’s glove-making workshop. We were fortunate to meet one of the guides who held court in the workshop. He thoroughly entertained us with stories of the house including the etymology of phrases deriving from ‘board’ (for example, the chairman of the board came about due to the leader of a meeting sitting in the chair at one end of a table comprised of a board atop a stand… other attendants would sit on benches on either side of the board table). We also learned about medieval architecture such as why many homes back then were so gloomy: windows had shutters versus glass windows; and, the windows were opened to let smoke out, not air in, which is why they used to be called ‘wind holes’). I found myself fascinated by this guy’s tutorial on medieval architecture and the inhabitants. At times I felt I’ll not budge an inch this guide was so entrancing. I easily could have followed him around all day begging for more information on the how’s and why’s of these buildings, let alone any tidbits tossed out about the inhabitants. William Shakespeare, like his father, was also quite a businessman. William did become famous during his time and used his fame to create wealth, one venture being converting part of his childhood home into the Maidenhead Inn (later the Swan and Maidenhead Inn) when his father died in 1601. Shakespeare’s eldest daughter Suzanne inherited it followed by her only child, Elizabeth, on her mother’s death. Elizabeth, Shakespeare’s only grandchild (1608-1670), married twice but had no children; so, upon her death, her aunt, Joan Hart, Shakespeare’s only living sibling, inherited it. For 250 years, until 1847, it remained in the Hart family. At that time a rumor sprung up that P.T. Barnum was planning on transporting the house to New York. He had toured England in 1844 with Tom Thumb and, during that time, also visited Stratford-on-Avon. Later he professed interest in purchasing Shakespeare’s home to add to his collection and show. A British group, including Charles Dickens, formed the Shakespeare Birthplace Trust, and raised enough funds to purchase it for £3,000 at public auction. Today the Shakespeare Birthplace Trust covers five homes associated with Shakespeare’s time in Stratford-on-Avon. We left his home and walked down the crowded streets to the Harvard House. This home was rebuilt by Thomas Rogers in 1596 after a fire destroyed parts of Stratford. It’s one of the reasons it has a tile roof (versus thatch) and a fire escape hatch as delays have dangerous ends. As a successful butcher and corn & cattle merchant, Rogers managed to build a substantial home, one we had all to ourselves as we climbed the stairs to deluxe rooms. Compared to Shakespeare’s home, the house seemed palatial with tall ceilings on the ground floor and some of the original paint decorating the plastered wattle (woven wooden lattices)-and-daub (animal dung, earth, clay and straw) walls. The home also featured a rare stained glass decorated with some plants known at that time. If you’re wondering why it’s called the Harvard House: Roger’s grandson John Harvard, married Ann Sadler and emigrated to Newtowne, Massachusetts Bay Colony, where he worked as a preacher and teaching elder. He died of tuberculosis in 1638. Before he died he wanted to contribute to the Colony’s fund to build a college, so he bequeathed £750 (over £3 million today) and his library of 250 books. A few blocks away we entered Shakespeare’s daughter Suzanna’s home where she lived with her husband Dr. John Hall. Now this felt luxurious compared to previous two homes. It was furnished from that time period including dish ware, paintings, even Dr. Hall’s pharmacy filled with jars that would have contained herbal remedies from their garden. Onward to Holy Trinity Church where Shakespeare was christened (1564), possibly married (1582) and buried (1616) along with his wife Anne (1556-1623). His three children, Suzanna (1583-1649) and twins Hammet (1585-1596) and Judith (1585-1662) were baptized here as well. Just a side note about his children, Suzanna was known for being clever. Her intelligence and marriage to a prosperous doctor (interestingly, his detailed medical records reveal he developed a treatment for scurvy made from asorbic-high, local plants and grasses over 100 years before remedies were widely known) created a rich life for herself and family. Shakespeare’s only son, Hammet, and second daughter, Judith, were named after close friends of William’s, the local baker and his wife. Unfortunately, Hammet died at age 11 and Judith had a sad life thanks to her marriage to a local vintner, Thomas Quiney. They were excommunicated because Thomas didn’t obtain the necessary license to wed during Lent, and later he was charged and found guilty of carnal copulation. Some rise by sin, and some by virtue fall. In short, Judith didn’t have the best of times and her tragedies also caused a lot of pain to her father, changing his will to protect Judith from her husband. Back to the church… there is a wooden bust that is lauded as being the only true representation of Shakespeare since it was put in place during his wife and daughter’s lifetime. However, repainting of the bust over the years means the original painted features and details have been lost. The church also features a sanctuary knocker where someone could escape pursers for 37 days, similar to the one at Durham Cathedral. With it becoming twilight we hurried back to the car park (we had only put in three hours and were over by five minutes, but, as good luck would have it, no ticket was attached to our windshield). We drove just out of town to Anne Hathaway’s cottage. It was located in a beautiful garden setting that would have been a leasehold during her parents’ time. Here, Anne grew up, the eldest of eight children. What I found very unusual is she was eight years older than Shakespeare, which was rare for that time (and in today’s world, too). However, their fathers were both bailiffs at one time so possibly William got to know Anne when the families visited one another; and, who knows? Maybe he had a crush on the older sister Anne? Anyhow, she ended up pregnant, and William’s father had to quickly get the priest to shorten the posting of the bans to two weeks from the typical three. Susanna was born six months later. During their marriage, as good luck would have it, William became wealthy first as a successful playwright and theatrical operator then as the writer and presenter of his own plays. However, there is no record of Anne visiting and living with William in London while he worked as an actor. She remained at Henley Street with her in-laws and later moved into New Place, one of the biggest houses in town, which Shakespeare purchased in 1596. This entitled Anne to a very comfortable lifestyle in Stratford. We were welcomed by a young guide who relayed wonderful stories about the house and the Hathaways. Anne’s ancestors actually lived in the house until 1892 when purchased by the Shakespeare’s Birthplace Trust mentioned above. The guide told us the Hathaways use to give tours embellishing a bit. They claimed that a settle (high-backed bench) by the kitchen fireplace was where Shakespeare wooed Anne. They then would carve off a piece to sell as a souvenir. Others must have had a difficult time believing that for the bench still stands fairly intact, which just proves the better part of valour is discretion. Upstairs a four-poster bed could be where Anne was born as well as the ‘second-best bed’ bequeathed by Shakespeare to his wife. As the guide explained this isn’t as demeaning as it sounds because beds were a prized piece of furniture, with the best ones generally used for guests while the plainer ones would be the husband-and-wife’s, thus having more sentiment attached to it and more valuable to the surviving spouse. Perhaps William lulled Anne to sleep with a verse: “Shall I compare thee to a summer’s day? Thou art more lovely and more temperate”, then woke her in the morning whispering in her ear “We are such stuff as dreams are made on, rounded with a little sleep.” To which she may have responded “I have not slept a wink” due to his snoring. If anyone would like a quick read about Shakespeare’s time, Bill Bryson’s SHAKESPEARE describes the setting in which this writer lived. As Bryson states, there is very little known about Shakespeare’s life, which wasn’t unusual back then (author Ben Johnson’s date of birth, names of parents, number of children is unknown, and architect Inigo Jones’ first 30 years on earth are a complete mystery). Instead of creating a cast of assumptions regarding this famous playwright’s life, Bryson provides the living background (from architectural to dietary) in which Shakespeare operated. It was dark by the time we left for our B&B outside of town but we did catch a glimpse of the beautiful Hathaway gardens. Here I thought I like this place and willingly could waste my time in it. Ahh, can one desire too much of a good thing? I think not. Next, a prominent location for any solstice watchers. This entry was posted in 2015 12 UK & WALES - Central & West Coast, 2015 Winter Tours, COUNTRY, Europe, Wales, WINTER TOURS on December 27, 2015 by margaretlynnie. Our friends Helen and Gus Wilson had just visited two towns a week or so prior to our road trip, and we decided to follow in their tracks based on their experiences. So, off we drove to Chester, a walled city dating from the Roman occupation 2,000 years ago. The cathedral is a must-see with some of the finest medieval carvings in Europe decorating the quire. Originally founded as a Benedictine Abbey in 1092, the church contains a mix of Norman and Gothic styles during its evolution to the present day cathedral. As we’ve discovered, these cathedrals are living museums still used today by congregations. Blending old with new, Chester’s cathedral was decorated for Christmas including Dicken’s tale of Scrooge. It was a bit odd to walk amidst large, storybook characters while touring a medieval building (actually, it was in the Chapter House Room where the monks use to meet and where the monastery’s founder, first Norman Earl of Chester and William the Conqueror’s nephew, Hugh Lupus, was buried) ; yet, I really appreciate keeping architectural and historical gems alive through modern-day use. In the nave Max spotted the Chester Imp or devil hidden amidst the upper windows.Legend has it a priest saw the devil in that spot, so they carved one and placed it there, on the north side – the side where, according to medieval belief, bad things happen (odd, but so is seeing ‘the devil’). Reading that the quire stalls hinged-seats had misericords, small wooden rests you can prop up on when standing, were of exceptional craftsmanship, we wanted to check them out. It was here we ran into a guide who generously answered our questions and explained that the carvings were so intricate the woodcarvers even detailed the hollow interiors of some of the knobs. And, these carvings were created using fairly imprecise tools compared to today’s equipment. He invited us to listen in on a short explanation he gave to several school children, one where he pointed out the elephant carving. He pointed to the animal’s feet, which were actually horses’ hooves because the carvers had never seen an elephant before and had to come up with their own design. 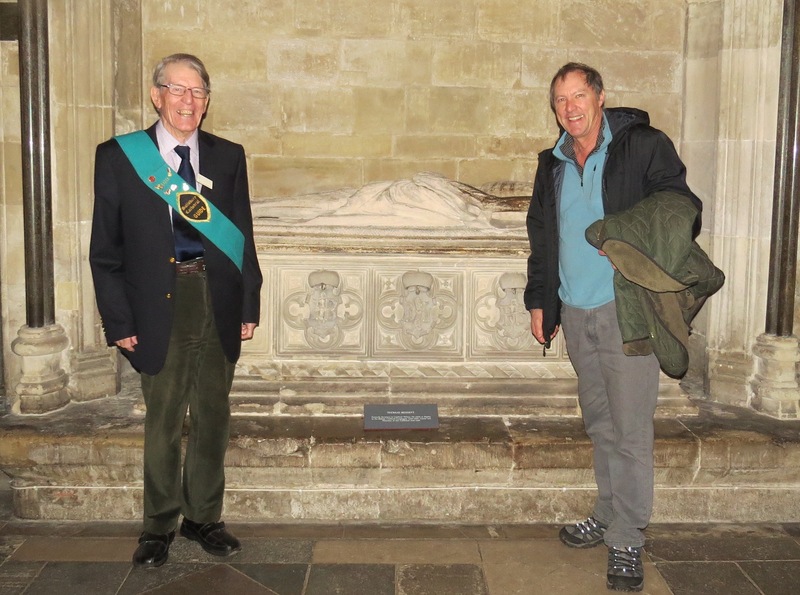 The guide then took us to a monument for a 17th-century bishop partly financed by an American bishop’s donations in 1863. Evidently the Bishop of Maryland thought very highly of this John Pearson, a Bishop of Chester (1672-86) who was instrumental in creating the first prayer/service book of the Church of England in 1662. Frankly, what interested me the most was seeing a mustache without any beard on this medieval face. I later read that in England facial hair (for men) ebbed and flowed with, no surprise, favored styles depending upon the royal’s facial coifing (James I and both Charles I and II in the 1600s displayed luxurious mustaches). Running into the guide was a gift, and it’s not the first time–nor the last–that we’ve left a cathedral in awe of the knowledge shared by such warm hosts. With that we exited the cathedral climbing up to the city wall ringing the back of it (it doesn’t look it but there’s a ten or so foot drop-off on one side of this walkway). Here we also glimpsed the Eastgate Clock commemorating Queen Victoria’s Diamond Jubilee. Eager to arrive at our next destination we headed back to the car via The Rows, one of Britain’s oldest shopping arcades built between 1200 and 1350. With Christmas just around the corner we have found many places packed with holiday shoppers, which made parking difficult but lent a spirited festive air to our travels. On the road again we drove directly to Conwy, another beautiful site, this one on the coast. In addition to being one of the finest surviving medieval fortifications in Britain, Conwy is also close to the home of a cruiser friend we met in the Azores during our 2014 crossing; and, we had arranged to meet Martin and his wife Hilary at their former cruising club. But first, we stopped to unpack at our lodgings, the local youth hostel, which, I must admit wasn’t my first choice based on previous hostel stays during our earlier travels. Yet, this one was stellar. It was also practically emptied, which made the common areas easy to use and very quiet. Once we were oriented with the kind help of the guy at the reception desk we walked downhill, under one of the city gates and to the waterfront where we supped at a local pub before entering the North Wales Cruising Club. There we were greeted by one of the members while the club quickly filled with others who were creating goody bags for their upcoming volunteer activity of playing Santa who comes by water, not by air. Soon Martin and Hilary arrived and we caught up over drinks in the warmth of this cruising club before heading back to our bunks. After breakfasting in the hostel dining room we left for the fortress castle eager to stretch our legs and learn more about this UNESCO World Heritage City. With over three-quarters of a mile long wall interspersed with 22 towers, this town represents England’s fear of Welsh insurrection under the rule of King Edward I (1239-1307) or ‘Long Shanks’ (6’2”). This English king was the heir of Henry III and Eleanor of Province. To secure control of Wales Edward built and refurbished a chain of 17 castles by 1283. The fortress that juts into the River Conwy sits on rocks which provide a natural deterrent to invaders. It’s a beautiful setting and remarkable considering these structures have remained standing since medieval times. mounted placards explained the historical signficance of the rooms and time Edward I spent cloistered in his stone fortress. What clearly came through was the Welsh sentiment towards their English ruler and fellow conquerors. We felt we could have been speaking with someone from those times due to the commentary provided on these 21st century displays. Obviously, King Edward I couldn’t die soon enough; and, from their view I can understand why. As in Scotland, signs and communications are bilingual to ensure this country’s language lives. Of course, we couldn’t understand a syllable much less a whole word when confronted with it. But, it’s a lovely language the few times we heard it spoken around us. In 1301 he named his son Prince of Wales, an appellation continuing to this day. He was responsible for the hanging, drawing and quartering of the Scottish hero, William Wallace in 1305. And, Edward died on route to fight the next Scottish rebel, Robert the Bruce, in 1307. Again, history’s fascinating connectivity captured us in its spell as we both recalled our Scottish travels earlier this year. and the smallest house in Great Britain. We couldn’t help noticing some paper stuck to the hulls of overturned dinghies and, after reading them, were thankful JUANONA’s dinghy was carefully stowed aboard. Due to the time of year another site, Plas Mawr, a 16th-century Elizabethan house, was closed for the season, so we decided to walk part of the town walls. Built in only four years (1283-1287), they ran for nearly a mile. The English lived inside, the Welsh, outside. Great way to engender comaraderie. Encircling the entire town, the walls make for a great viewing platform, both of the river and of the town itself. With more daylight time ahead of us we jumped back in our car to toddle around the countryside for an hour, noticing flooded areas due to earlier storms that devastated the Lake District just north of here. This entry was posted in 2015 12 UK & WALES - Central & West Coast, 2015 Winter Tours, COUNTRY, Europe, Wales, WINTER TOURS on December 22, 2015 by margaretlynnie. Wiinter being a slow time at our marina in ipswich, we decided to explore more of Great Britain, this time heading NNW towards Liverpool and environs. But, before we landed on the west coast of England we wanted to catch a glimpse of one of our favorite people, Stephanie Green. We had met Steph in English Harbor along the Turkish coast in the summer of 2003; and, ever since we’d been in touch including several visits, one in the U.S. where her travels drew her from Mexico to Maine with her faithful pup, Muneca, and then, again, in London in 2010. The reunion occurred just down from her place of employment. Hugs abound and a too-brief reunion, one we hope to expand upon next time we’re together. After leaving Steph we made it to our destination in spite of several mis-turns during Liverpool’s rush-hour traffic. With backpacks loaded we headed to our hotel and then began our exploration of this city at night. Determined to hear some music while here we decided to check out a Mumford & Sons concert. Unfortunately, the scalped ticket price seemed a bit high so we ended up fortifying ourselves with a picnic dinner of chicken that goes round-and-round and a salad. A bit odiferous of an elevator ride to our room (one my sister knows since we did this in 2000 in a much fancier hotel…). Afterwards back to the streets where it seemed all the bars shilled live music and free shots. We visited the small iconic Cavern Club, site of many of The Beatles early concerts, then called it a night. John lived from age 5 to 22 with his aunt and uncle in the house below (John’s room was in the upper left). Our tour guide, who personally knew the Beatles, offered interesting background such as how John’s mom was killed on the street in front of this home by an off-duty policeman who didn’t yet have his driving license, who John came to believe was drunk. Charges against the officer were subsequently dropped, and our tour guide suggested this was a major factor in John becoming disdainful and distrustful of the Establishment. Many of the Beatles’ songs include references to all of these landmarks, such as the orphanage for girls off John’s back yard named Strawberry Fields. Aunt Mimi would tell John “if you get caught sneaking in there to spy on the girls, you’ll be hanged…” John’s reply in verse: “Nothing to get hung about.” This is also where John sang “No one I think, is in my tree …” He sees himself as different, outside the mainstream. All during our tour guide’s patter and landmark views I couldn’t shake a feeling of melancholy. Our tour coinciding with the anniversary of Lennon’s death in 1980 may have contributed to an underpinning of sadness; yet, the feeling came from more than a single moment in time. In retrospect I believe it’s visiting sites that are part of my time in life. I grew up with The Beatles, watched them on The Ed Sullivan Show, listened to their songs all through high school and college and then some, and still catch sight of Paul and Ringo on TV during nostalgic flashbacks. So, driving down memory lanes led to reflecting on my own childhood. And, to be looking back versus forward also meant remembering a time filled with people who are no longer with me. I guess the short answer to this source of melancholy was I felt old, something I avoid when possible. Yet, here I sat on a bus reliving a part of my generation. An odd sensation. Among all of the interesting tidbits shared by our bus host two stood out to me: one, what great musicians these guys were; and, two, just how much they were like ‘boys next door.’ I mean, I could actually visualize how they formed their band. What also helped later with that impression was a documentary Carol E., a friend of ours recommended, called GOOD ‘OLE FRIDA. That movie really drove home the boyhood spirits of The Beatles. But, enough of that! After hopping off the bus we made a beeline for one of Liverpool’s excellent museums: The Merseyside Maritime Museum. Located on the River Mersey at the Albert Dock this museum includes other informative displays, including the International Slavery Museum and exhibits on two tragic cruise liners: the Titanic and the Luisitania. The International Slavery Museum came to be due to Liverpool atoning for its horrific part in the slave trade. As some historians say, the city was built on the backbone of slavery, and Liverpool decided to shine the light on their past as a way to educate, versus whitewash, this heritage. During the 1700 and 1800’s this port city served as the place for slave ships to offload raw goods produced by slave labor (sugar, tobacco, coffee and cotton) and load up on finished goods (textiles, copper, brass and guns among the bulk of the cargo) before sailing to the west coast of Africa. In the early 1700s a total of 15 ships left Liverpool as part of this trade triangle. By 1750 it had grown to over 100 ships. Over 1.5 million Africans were transported by Liverpudian ships. This trade created huge wealth for many, including James Penny. Rich merchants populated the city resulting in quite a few streets carrying their names. In 2006 protests sprung up demanding the street named for James Penny, Penny Lane, be renamed due to its association with slavery; however, for most people the street name was linked to The Beatles, an important tourist draw. So, in lieu of changing the name the city opted to focus on expanding its popular 1994 Transatlantic Slavery Gallery. This world-class museum was opened in 2007 documenting Liverpool’s involvement in the odious slave trade. The International Slave Museum provides a thorough history of the slave trade beginning with various shipping routes per colonizer: from Europe to West Africa to the New World (the Caribbean and the Americas). From there exhibits depict the agony of human transport and further inhumane treatment on plantations. Along the way one can hear live interviews given by individuals whose ancestors were involved in the slave trade. Lest we think this has all ended, the museum reminds visitors human trafficking continues today. With minds buzzing from factual overload we decided to return to our rooms, grabbing another picnic dinner. We planned our next day’s activities, then crashed for the night. Meanwhile I explored the Tate Liverpool museum, both back on the waterfront where we were the previous day. To me modern art can engender either a ‘WOW’ factor or an ‘you’ve got to be kidding me’ snort, and the exhibits here caused both of the above along with a ‘glad I saw it, no need to do so again’ thought. The WOW response occurred during the viewing of a traveling Matisse exhibit. Four bronzes, the artist’s largest sculptures and cast posthumously in 1955-6, chart Matisse’s migration from more realistic to more abstract versions of a model’s back, “Nu de Dos”. Definitely imposing, informative and beautiful. From those I wandered up several floors with an interesting concept for displaying art: Constellation Exhibits where the curator selected one artist who then influenced others. I actually recognized some of the artists but must say the more modern, the more I made ‘you’ve got to be kidding me’ snorts. By the end of one exhibit showcasing five folded blankets I realized my snorts were becoming audible and definitely not attractive. Fortunately I arrived in front of a piece by the sculptor Dame Barbara Hepworth and could happily stop snorting and give a grunt of satisfaction. Her ‘Single Form’, a monolithic piece out of brass, showcased the connection between nature and surrealism; and, I especially appreciated her belief that “… every person looking at a sculpture should use his own body. You can’t look at a sculpture if you are going to stand stiff as a ram rod and stare at it, with a sculpture you must walk around it, bend toward it… “. Frankly, some of the best art were the framed views glimpsed through large windows in each gallery. The last floor I toured showcased a special exhibit called “An Imagined Museum”. It wasn’t the best use of my British pounds BUT have to say every time I’m in front of such art I have a friend’s admonishment in my head reminding me that, although this may look easy, it’s not. With that I finished my snorting and grunts, left the floors and rewarded myself with a cup of luxurious, non-instant coffee while sitting in the lovely museum cafe and gazing through to Albert Dock’s inner harbor. Meeting up with Max at the Museum of Liverpool we toured it together, walking through the city’s history. At one point I stopped at a plaster footprint of one of the area’s earliest inhabitants from 4,000-6,000 years ago only to note it had the second and third toes stuck together. Made me feel at home considering I have the same on both feet as did my father and my mother’s mother and also a first cousin’s son. Reminded me of another excellent book, a historical novel written by Edward Rutherford called SARUM. The tale covers a swath of English history, beginning with inhabitants with web toes. (Note: Unlike fingers, there is no extra skin webbing so I prefer ‘stuck together’ as the correct descriptor for my trait… ). Then Max decided to see yet more Beatlemania while I preferred to stroll around the city. I must say Liverpool, for both of us, was a surprise. I had expected a much more industrial city, grimy and time-worn. What we found was a beautiful city with striking new architecture amidst lovely renovated buildings. The docks, of which Albert Dock was only one of many, offered visitors plenty of education thanks to the museums strung along the river bank. Better yet, most of them were free, which always makes a city tour easier. My last foray before meeting Max at the hotel was a visit to the Liverpool Anglican Cathedral, the longest one in the world, the fifth-largest, and, just to throw in another superlative (as if you care), one of the world’s tallest, non-spired church building. Had enough? Me, too. This cathedral is also where Paul auditioned but didn’t get a position as a choirboy (his voice wasn’t good enough). One more interesting cathedral fact: it was designed by Giels Scott who won the 1903 competition at age 22. Right next door was the entrance to Liverpool’s Chinatown, which we didn’t explore but did appreciate the colors. Discovering that the Annual Carol Concert would be held later that evening, I hurried back to our room where I mentioned it to Max. He also wanted to hear the music; so, we ran back only to find out we were two hours early. Off we went to dinner returning just in time to find seats next to a family with two young children. The boy who must have been around ten had his ears plugged and leaned forward in his seat as protest for most of the night. Obviously not a big fan of church music. Must say I would have joined him during the last reader’s presentation. The guy who was one of the sponsors of the concert probably doesn’t get a chance to talk much. On and on and ON he went. Finally someone must have performed the universal signal of hand slicing the throat for he finally left the podium. You could feel the overwhelming thank-the-lord sighs emanate from the audience, mine being one of the loudest, no doubt. Still in search of more music Max and I scouted out several haunts for live acoustics. Unfortunately, nothing really panned out; however, our visits to three different bars only reinforced the enchantment of Liverpool with no small thanks to the young folk who appeared happy to sincerely help us in our search. and the graveyard where Max spotted an “Eleanor Rigby” who certainly couldn’t have been that lonely considering how many relatives surrounded her. Then driving a bit further to the Casbah Coffee Club in the suburb of West Derby. By now we were Beatled out and ready for the beautiful of Wales and hopefully another reunion with some more cruisers. This entry was posted in 2015 12 UK & WALES - Central & West Coast, 2015 Winter Tours, COUNTRY, Europe, Wales, WINTER TOURS on December 20, 2015 by margaretlynnie.